Aircraft Sustainment and Repair is a one-stop-shop for practitioners and researchers in the field of aircraft sustainment, adhesively bonded aircraft joints, bonded composites repairs, and the application of cold spray to military and civil aircraft. 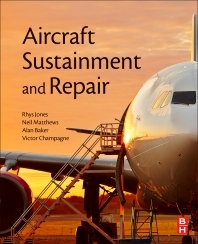 Outlining the state-of-the-art in aircraft sustainment, this book covers the use of quantitative fractography to determine the in-service crack length versus flight hours curve, the effect of intergranular cracking on structural integrity and the structural significance of corrosion. The book additionally illustrates the potential of composite repairs and SPD applications to metallic airframes. Rhys Jones is a Professor of Mechanical Engineering at Monash University where he is also Head of the Centre of Expertise in Structural Mechanics. With over 450 publications, Professor Jones has made significant contributions to the fields of aircraft structural integrity, fatigue life extension, thermo-elastic stress analysis; fatigue assessment and fracture mechanics; computational mechanics; aging structures; repair technology; Supersonic Particle Deposition and composite materials. Professor Jones is internationally acknowledged, together with Dr. Alan Baker, as having played a pioneering role in the development of advanced composites to extend the operational life of Military and Civilian aircraft and played a leading role in transferring this technology to the US as part of the US Federal Aviation Administration’s Aging Aircraft Program. Neil Matthews is the Head of Research and Technology at RUAG Australia, and holds a Master of Aircraft Design from Cranfield University (UK) Neil has been involved in Aircraft Engineering sustainment for the nearly 40 years both as a serving Air Force Officer in the Royal Australian Air Force and then in the commercial military aviation industry. Neil has been pioneering the use of SPD for aircraft sustainment since 2004 and has co-authored journal papers and been an invited speaker on this technology both in Australia and internationally on a number of occasions. Victor K. Champagne Jr is the Director of the US Army Research LaboratoryCold Spray Centre, Aberdeen Proving Ground, Maryland, USA.He is recognized internationally as one of the foremost authorities on Cold Spray. He has held numerous positions throughout his career working closely with industry and academia. In his 34 years of materials research and development experience, he has been responsible for the advancement of emerging technologies for the Department of Defense, and his ideas have been translated into practical use and transitioned into industry and his achievements have been recognized across the globe by international organizations, major television networks, the Pentagon and even US Presidents.